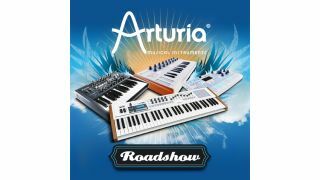 Arturia is hitting the road. Sébastien Rochard of Arturia will be in-stores demoing the power and creativity of Arturia's latest creations, with tips, tricks and ideas on how musicians can use these new products to take their productions to the next level. It will be possible to put questions directly to the experts and get an exclusive hands-on with the very first KeyLab in the UK, make beats on SparkLE, and analogue tones on MiniBrute. The new KeyLab controller keyboards are Arturia's most advanced hybrid synthesizer products yet, offering immediate and in-depth control of the included Analog Lab Plug-in instrument (with over 5000 editable sounds from their vintage synth recreations), and featuring a huge range of controls ready to map to control DAWs, other plug-ins and external hardware gear.